Slatwall hooks will easily slide into any slatwall panels. The types of slatwall hooks you want will depend on your store needs and products you will hang on them. Regular slatwall hooks can hold small to medium size items, while, heavy duty hooks can hold heavier items like fun-size chip bags. Another special design hook is our scanning hooks for slatwall, they are usually seen at convenience stores or gas stations but still suitable for any type of retail store. The scanning hooks has an extra hook used to place barcode tags. We even have key locks to attach to these hooks if you need to hang valuable items. Slatwall hooks will support mostly any item you “throw” at it without a hitch. 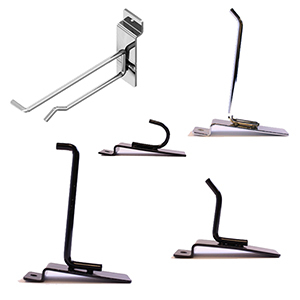 Call us at American Retail Supply to see which type of hooks is suitable for you because we want to provide you with the best product first time, 1-800-426-5708.